Though it may look like it, this cone-shaped concrete structure towering above the Johannesburg suburb of Midrand isn’t an art installation. 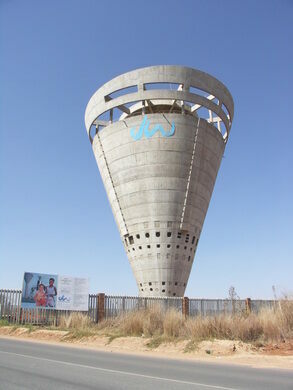 The Brutalist-inspired tower is operated by Johannesburg Water, stands 131 feet tall, and holds nearly 2 million gallons of water for the surrounding community. Built in 1996 and designed by a local architecture firm, the Midrand water tower was a nod to a vanishing architecture movement, the boxy concrete of Brutalism. 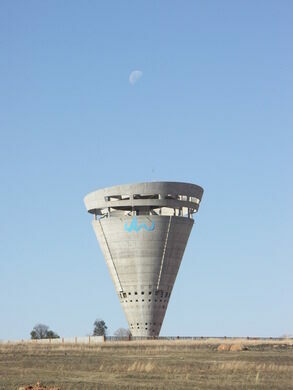 The giant concrete spiral rises up over the Midrand landscape. Only the top half of the tower is filled with water. The vacant areas were designed to hold commercial space. Its creators refer to the building as an “urban sculpture,” and its spiraling, tornado-like form certainly makes it one of the most noticeable buildings in the area—and any area, really.